J.T. 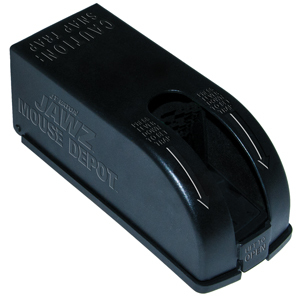 Eaton’s new covers for its Jawz Mouse Depot Mouse Trap (#407BULK, pictured) and Rat Depot Bulk Rat and Chipmunk Trap (#408BULK) are an effective way to conceal the Jawz traps and prevent the chances of non-target triggering. The covers also help protect children and non-target animals while hiding the trap and captured rodent from view. Reuse as desired, or dispose of with captured rodent. Traps can also be used for voles and shrews.